Nonstoichiometric Oxides discusses the thermodynamic and structural studies of nonstoichiometric oxides. This eight-chapter text also covers the defect-defect interactions in these compounds. 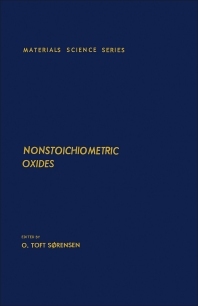 The introductory chapters describe the thermodynamic properties of nonstoichiometric oxides in terms of defect complexes using the classical thermodynamic principles and from a statistical thermodynamics point of view. These chapters also include statistical thermodynamic models that indicate the ordered nonstoichiometric phase range in these oxides. The subsequent chapters examine the transport properties, such as diffusion and electrical conductivity. Diffusion theories and experimental diffusion coefficients for several systems, as well as the electrical properties of the highly defective ionic and mixed oxide conductor, are specifically tackled in these chapters. The concluding chapters present the pertinent results obtained in nonstoichiometric oxide structural studies using high-resolution electron microscopy and X-ray and neutron diffraction. Inorganic chemists and inorganic chemistry teachers and students will greatly appreciate this book. III. X Rays or Neutrons?